Ever since I was a nine-year-old girl obsessed with Little House on the Prairie, I've dreamed of living a quiet, simple life in the country. Mawmaw, my dad's mom, ran a cattle farm in rural Alabama, and back in the 90's, we visited her at least once a week. I was fascinated by her life in the country. I loved the silence. The trees. The lonely dirt roads. The expanse of sky and the impossible brightness of the stars at night (they didn't look anything like that in the city where we lived). I loved picking wild blueberries in the woods behind her house. Throwing rocks in the creek that ran through her property. Feeding long blades of grass to her cattle and peeking in on her chickens. I remember begging my parents to build a log cabin in the woods behind Mawmaw's house during my Little House phase. We'd have our own forest to explore, clear views of the night sky, a huge garden, maybe even our own livestock, and all the while, we would wear bonnets and bloomers and pack our lunches in little tin pails to take down to the creek for picnics. Despite my teenage fantasies of fame and Hollywood mansions, that initial Little House-inspired dream remains with me today. Minus the bloomers. I still want my own land. My own garden. I still long to run freely through grassy fields, Melissa Gilbert style. In 2017, smothered by the rush and constant busyness of society, the excess of our consumerism-driven culture, the fixation with smart phones and social media, I crave the quiet, simple days on Mawmaw's cattle farm. Perhaps this is why my husband and I dream of homesteading. We long for acres. Lots of our own quiet, partially wooded land, with more than enough space for chickens and goats and maybe cattle. A huge garden. An orchard. A modest, simple house that isn't the 2000+ sq. ft. suburban McMansion most people seem to idolize. Living on the third floor of an apartment outside a big city, this idea is merely a lofty dream. A "perhaps someday." But that hasn't kept us from researching the subject like crazy. And in all that research, I had an idea. You see, we're still struggling to get our spending and eating habits under control. Amazing restaurants dot every corner in this city, and the fact that one of my two jobs is waiting tables at one of my favorite restaurants doesn't help matters. So I thought, What if we did a month-long challenge where we ate only food we could access locally- if we were legit homesteaders? We're always talking about what we want to "perhaps someday" grow and raise on our future homestead. What if we ate and drank only those things? 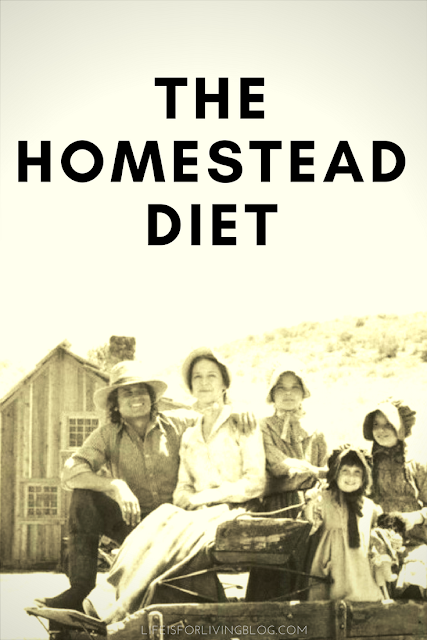 And the "Homestead Diet" (though I loathe the word 'diet') was born. Intrigued, Matt and I sat down and listed all the things we wanted to raise and grow that would be realistic options to try on a farm in northern Alabama. We also included on this list things we could hunt and forage in this area. Unfortunately, we aren't likely to grow coffee on our Alabama farm, but coffee is, at this point, non-negotiable. Pioneers were able to obtain this commodity at their nearest general store, so we thought it was okay to include a "General Store" category for a few basic staples. Like coffee. Surely you understand. After reviewing this list, we realized we'd be slashing our grocery and dining out budgets BIG TIME and cutting out all kinds of sugary, processed junk food we've fallen back into. No chocolate, no "healthy" sodas like Dr. Better, not even ketchup. And it all felt like a fun game. What a win. So, that's where we are this month. We made up our imaginary homestead, and created a meal plan from it. So far, we've only spent a fraction of our weekly grocery budget (which is unheard of in our house!) because the food is so simple. I'm even feeling more energetic and less bloated, probably just from eating vegetables again. I work in a pizza restaurant, so uh, it's been nothing but dough, cheese, and meat for a while now. It's forced us to get back into homemade food. Like this gorgeous loaf of organic whole wheat bread Matt made for the week. Only four ingredients, it cost half of what a comparable loaf at Whole Foods costs, and it made our apartment smell like Heaven. On that note, we've been going very old school with our cooking. The Little House Cookbook has been a great resource for discovering how true pioneers lived off the land and stretched what they had. There are recipes for everything from cracklin' cornbread to wild duck. Matt hasn't obtained his Alabama hunting/fishing licenses yet, but he has been using his woodland knowledge to gather edible wild plants for our kitchen. Like these lovely morels. We also have a few seedlings growing on our apartment balcony that will hopefully provide some homegrown goodies for us this summer. Heirloom tomatoes, strawberries, and half a dozen different herbs. So, what do you think? Would you try this? Do you, too, share the pioneer-living dream? What would you grow on your imaginary homestead? Ohmigosh I love this!! I have been watching When Calls the Heart and thinking the same thing!! So you have a sample meal plan you'd be willing to share? Also do you find meal prep or shopping more time consuming? I would imagine the shopping is easier, but some of the prep could be longer. Thank you so much for this post! Soul sister! 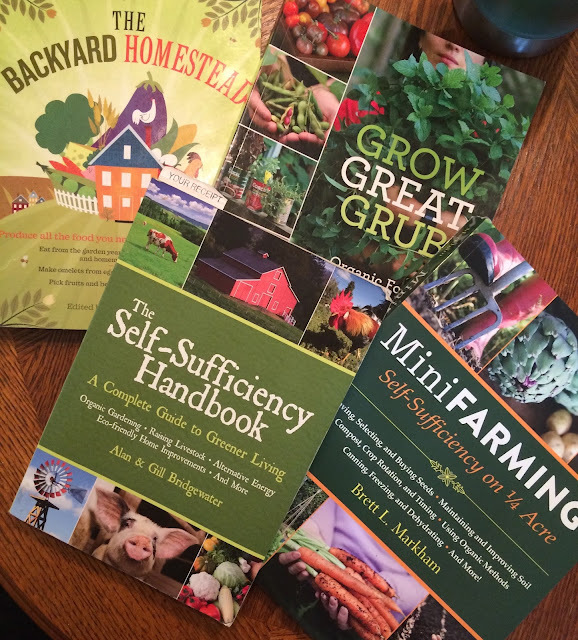 I'm not kidding - I've been reading about modern homesteading this week! I've found some great articles about apartment/suburban homesteading - things you can do *now*, where you're at, while you dream of your ideal country home. There's a lot you can do now! I'm really interested in making some homemade cleaning products and altering my diet a bit as well. I eat pretty well, but there are some processed things I can cut out. I'm fascinated by all of this! The route you guys took does sound like a fun game... I may have to try it next month! That bread looks amazing. Can you share the recipe please? I built a raised garden bed last month and can't wait to get the vegetable garden started. I am leabing more and more toward self-sufficiency. Your reminders of the Little House phase brought back so many memories! Glad you've found a way to achieve a piece of your dream - and save money! What a rare combination, since we usually have to put off our dreams because we don't have the money. We were gonna have joining farms and go to town in our covered wagons, while all gussied up in our pioneer attire. And I wonder why I had very limited childhood friendships...Mama was right; we never "liked" anything, but everything always became "all we think about", LOL. This was before the spy/private investigation phase, right? But this still resonates with me now too! I definitely could see myself living in the country some day, but probably way in the future. Living alone is daunting enough in the "city". But this is a very fun, creative challenge! There is hardly anything more satisfying than harvesting fresh produce from your own garden. It's super hard work but oh man...fresh veggies are soooo much better than anything you can buy.